John Kennedy CBE, KSG, KCHS, KMCO, DL is an exceptional man. Enterprise and hard work are at the centre of his inspirational story. Brought up in a large family in Ireland, he came to North West England and founded John Kennedy Civil Engineering. Over the next three decades, turnover grew from £10,000 to £60 million, making it one of the UK’s most successful construction and engineering companies. His business standing and grasp of complex issues saw John at the forefront of efforts to support the democratic peace process in Northern Ireland. He was instrumental in the establishment of Warrington’s Peace Centre after the 1993 bombing, and remains active in ‘Co-operation Ireland’. This initiative, which he has championed from the outset aims to promote peace across the United Kingdom and Republic of Ireland. Its patrons are Her Majesty Queen Elizabeth the Second and The President of Ireland. Passionately believing that success entails “putting something back”, he has given generously of his time, energy and finance to those causes closest to his heart. His contributions to charity, business and education have crossed international borders and led to the creation of new enterprises, regeneration initiatives and community projects. 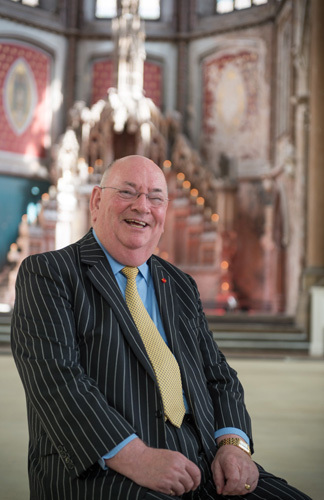 Recognition of John’s endeavours have included his appointment as a CBE from HM The Queen, The University of Liverpool’s honour of awarding John an Honorary Doctorate of Laws and his appointment as a Deputy Lieutenant in the County of Greater Manchester. John Kennedy CBE is the recipient of a Papal Knighthood from Saint John Paul II and feels privileged to have met Pope Francis in person in Rome in 2013. John has met his Holiness on several occasions since and has recently received the Lazarus Medal from the Pope (an award which celebrates charitable giving worldwide). He was recently presented with The Legend of Industry Award by Variety, the UK based Children’s charity which he has always supported.